Opposition leaders sang praises for Defense Minister Ehud Barak whose Beit Hamachpela eviction has undermined the government he sits in. Opposition leader Shaul Mofaz said Wednesday that the eviction of Jewish families from Beit Hamachpela house in Hebron was "a necessary action according to the law." "The law is the law is the law, and it must be carried out," Mofaz said. When it comes to following the law, Mofaz continued, "There is no difference between a simple minister, the defense minister or any other senior official." Defense Minister Ehud Barak's decision to evict 15 families from their newly purchased Hevron apartment building was predicated on the opinion of Attorney General Yehuda Weinstein. Of particular note was that Barak's push to evict the families at Beit Hamachpela was based not on a court decision – or even challenge – to the purchase, but the families’ failure to properly validate the sale with his own ministry. 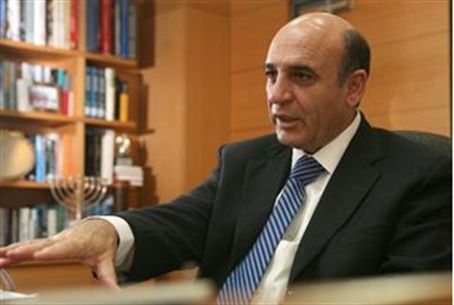 Mofaz nonetheless added sharp criticism of Prime Minister Binyamin Netanyahu's government's relationship with the courts. "In the past three years, there have been attempts at anti-democratic legislation and inappropriate hesitations from the government on whether to carry out the decisions of the high court and implement the law. I hope this is the last hesitation from this government, because the law is above all." It remains unclear how Mofaz's rhetoric applies to Beit Hamachpela in that no decision by the high court had been rendered, or law had been violated. Validation of the sale by the Civil Administrative is a bureaucratic requirement for habitation. Indeed, Barak's decision violated an agreement with the Prime Minister, Minister of Strategic affairs Moshe Yaalon, and Minister Without Portfolio Benny Begin to delay the eviction until April 26 – after Passover. During that time the government intended to "establish the legal facts" of the Beit Hamachpela purchase. “I do not know why the Defense Minister says that an examination of the sale will take weeks when it can be done in just a few days,” Yaalon said after the eviction. Labor party leader Shelly Yechimovich joined Mofaz in expressed support for the evacuation of the Hebron house. "The security establishment and the rule of law cannot be trampled upon," Yechimovich said. She criticized Likud ministers who opposed the evacuation, saying they should act like "ministers of a national and responsible party" and not compete for the attention of the extreme right. Yechimovich did not explain how establishing the legal facts of the case before proceeding constituted trampling the rule of law.